Over the past several years, Lightspeed has assembled The Gravity Network by vetting a select group of data providers and platform companies to support a growing demand for high quality, globally consistent sample for programmatic, on-demand and price-sensitive insights projects. These include companies in the market research and panel space, as well as more technical platforms in the media, data and CRM space. 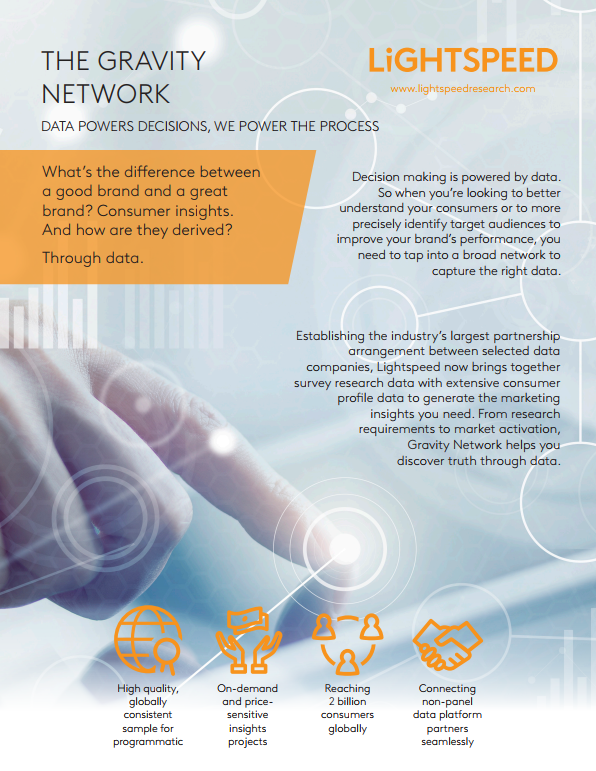 Select partners in the Gravity Network include GroupM’s [m]PLATFORM, Lucid’s Fulcrum Platform, Cint, Kantar Millward Brown’s Ignite, Wunderman Data Products’ Zipline, Tap Research, P2Sample and Dalia. This network represents a vastly larger pool than traditionally sourced Double Opt-In (DOI) research panels alone and will grow with new partnerships.